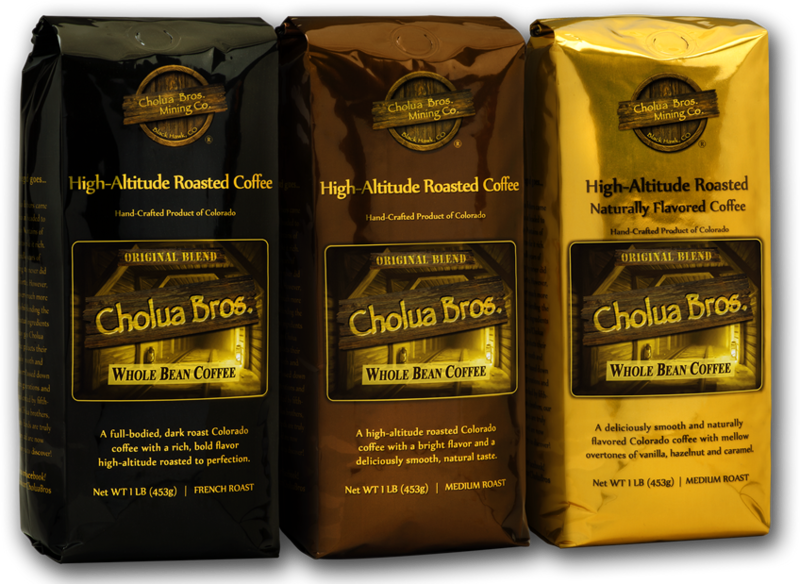 Cholua Bros. High-Altitude Roasted Coffee is as legendary as the Colorado Gold Rush. We roast our coffee at peak elevation just as our ancestors did almost 100 years ago. Our legendary high-altitude roasting process eliminates the scorching of coffee beans and produces a smooth and bold coffee flavor without any burnt or harsh aftertaste. You can just smell the Rocky Mountain aroma and taste the history of Colorado in each and every sip. Sold in 1 Lb. bags, our Whole BeanCoffees are made from the finest blend of Central and South America Arabica coffee beans. dark rich flavor as bold as Colorado! has a bright flavor and deliciously smooth natural taste. creating mellow overtones of vanilla, hazelnut and caramel.